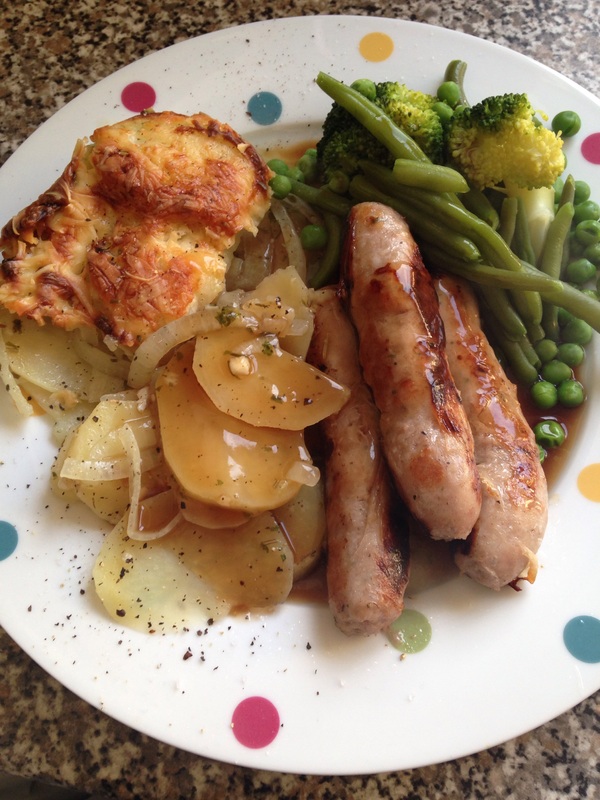 We had a cheap and filling late lunch today, a cheesy potato bake served with Aldi sausages and vegetables. As we were going to the cinema I wanted to keep it simple. This is how you make it. 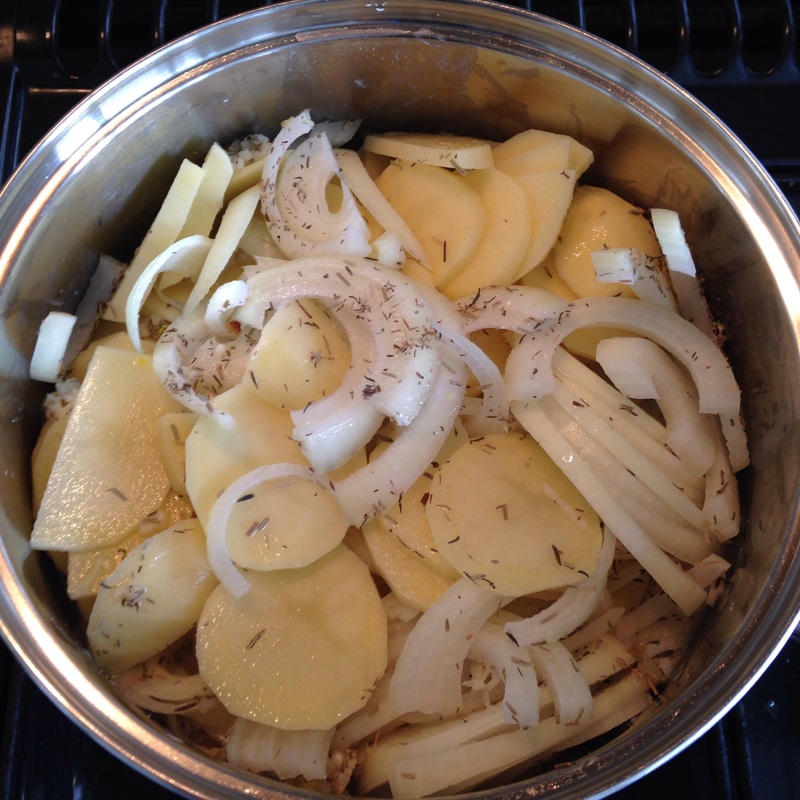 Place the spuds, onions and garlic with the milk in a large saucepan and bring to the boil, then simmer for 5 minutes. Stir in all of the herbs and season well. Grease a large casserole dish and pour the potato mixture in. Cover with the grated cheese and bake at about 180C for 45 minutes. Eat as an accompaniment to sausages or as a vegetarian main with some vegetables. 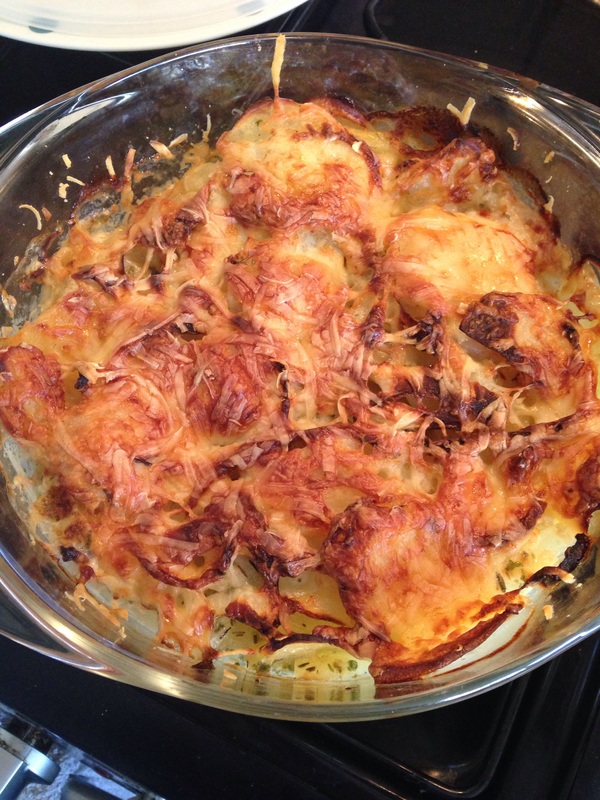 This cheap and easy cheesy potato bake is also vegetarian and gluten free. We saw the Stephen Hawking biopic The Theory of Everything tonight. What a great story and an excellent film. I really recommend it if you can get to see it! Now I know just what I want for dinner tonight, many thanks. I will tweak it a bit though and add sweetcorn and a chopped red pepper to the potato mix to give me a one pot wonder. Looks delish, but a couple of questions: In the first step, do you add water to cover the potatoes and onions and garlic, and then drain it all? (I don’t see how it’ll boil unless you’re adding water; maybe you’re just sauteeing it?) And I’m assuming you put the milk in when you pour it into the casserole dish? Thanks! PS: I agree, excellent film, terrific actor!